It’s been a while since we last published a blog due to the fact we’ve been in the middle of some major projects, especially throughout the last six months of 2013. We were incredibly busy in the run up to Christmas, not only producing a huge volume of orders, but also finishing off the extensive expansion of all our production capabilities. It has been ‘all hands on deck’ to make sure we had everything finished as soon as possible. For most of last year we have been involved in increasing the size of all the production areas, including building on two new extensions to the factory. 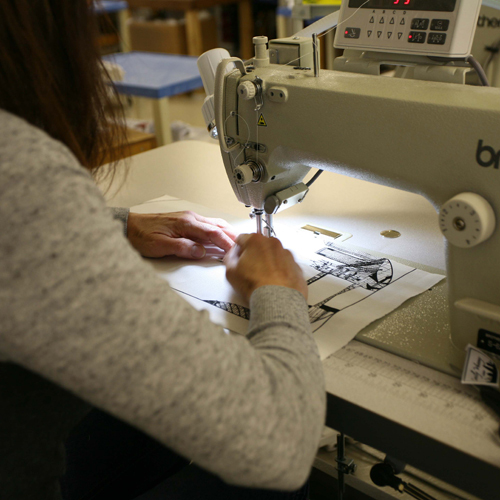 These extensions have enabled us to enlarge the size of our screen and ink mixing departments, our sewing unit, and our despatch department. The extra space has also enabled us to take on additional staff too. kitchen textiles, cushion covers and t-shirts. Set-up costs are low and the amazing print quality has to be seen to be believed. Finally we have put new software programmes in place, enabling us to keep track of the progress of orders throughout the system from start to finish. Our goal, with this extensive expansion programme, has been to aim to reduce our lead times to their traditional levels whilst maintaining our same superb product quality. 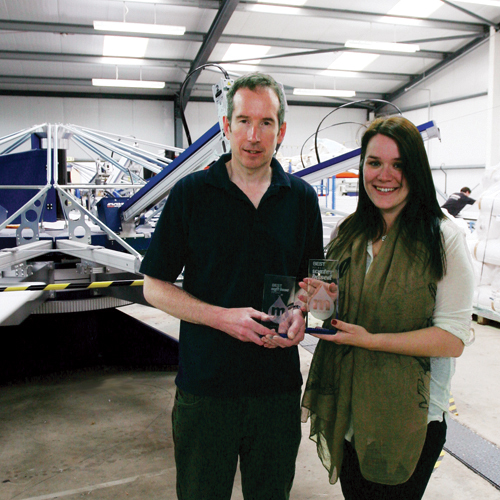 Theresa Dever of Magna Colours presenting Lawrence, our Director and Print Manager with our two first prize awards We have become busier and busier ever since moving to our new factory in 2006. Events such as our company winning Best Overall Water Based Print and Best Softbase print at FESPA 2013, which is the world’s largest digital and screen print show, have raised our profile yet further and are testament to the great care and attention we apply to every order that goes through our company. We very much appreciated the great loyalty our customers have shown us throughout 2013, when our lead times were more extended than we wished, and thank everyone for their patience. We are looking forward to working with both old and new customers in 2014 with our new and improved production facilities.